Something wonderful and heretofore-unseen happened in March 2018 in the formerly Communist country of Belarus, part of the Soviet Union until 1990. 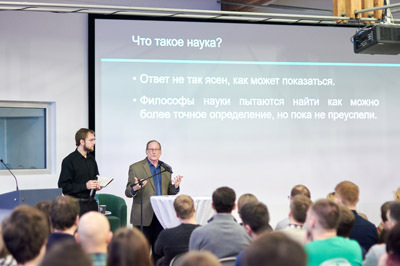 The capital city of Minsk was the site of a public debate between two scientists: Dr. Mikhail Gelfand, an atheist biology professor at Russia’s Moscow State University, and Probe’s own Dr. Ray Bohlin, a Ph.D. in molecular biology. 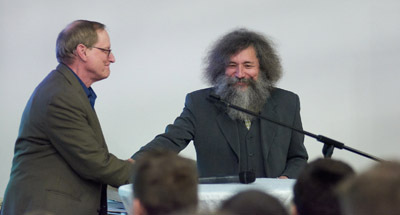 Ray had submitted a number of intelligent design-related topics to Dr. Gelfand who refused them all, deciding instead on the topic “Evolution or Creationism?” It was clear he was expecting a religious rather than a scientific argument from Ray, who presented “Is intelligent Design Science?” with the primary evidence that the DNA genetic code requires an intelligence. Dr. Gelfand did not respond to any of Ray’s points. Following their presentations, the debaters responded for an hour to written questions submitted by the audience. One question was, “Would either of you consider changing your mind if shown sufficient evidence of the other side?” With clear contempt, Dr. Gelfand dismissed the possibility that there was evidence for anything other than evolution. Ray related how, in his graduate studies in evolutionary biology, he continually asked, “Show me the evidence for evolution. Please convince me.” By the end of his studies, he was more of a skeptic of evolution than ever before. Concerned about making his flight back to Moscow, Dr. Gelfand gathered up his things. He was very surprised when Ray came over and, smiling, shook his hand after having been insulted several times during the debate. Christian kindness and compassion is its own kind of culture. Following the debate, 55% of participants in an online vote chose Ray as the winner. The debate was uploaded to Russian YouTube with over 1000 views that weekend (Link to English YouTube video is here). There was quite a bit of social media buzz about it, including requests to bring Ray back to Belarus in November for another debate. This was Ray’s 14th trip to Belarus, and every time he goes, he speaks in the churches of people who have become friends. 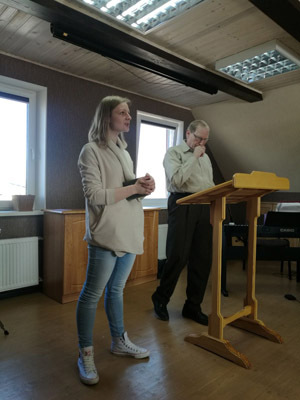 The first Sunday (of three), he preached in a church outside Minsk where one of his excellent translators is a teaching elder. He preached on Romans 1:18-20 in every church he spoke at, because after the previous day’s debate, many young people asked why the belief in creation mattered. Drawing on his worldview perspective sharpened by 40+ years of speaking and writing for Probe, he said that if there is no God, there is no purpose or meaning to any living thing—especially humans. Romans 1 assures us that we all know there is a Creator, so maybe the Creator’s intended purpose and meaning for us gives us worth and value. This is especially good news in a country that was recently Communist, which denies the worth and value of people. Questions continued through lunch, turning Sunday into another four-hour marathon like the (debate) day before. On Saturday afternoon, he spoke at a student conference sponsored by CRU (formerly known as Campus Crusade for Christ). Both the Christians and the seekers in attendance were interested in hearing Todd address problems and issues in technology, and Ray was asked to address the problem of evil. Todd and Ray, along with their translator Sasha and his wife, took the train to Brest, arriving very late at night. The next morning was the second debate, arranged by the pastor of Brest Bible Church, who had seen the YouTube videos of Ray’s 2016 debate and 2017 lecture, and really wanted him to come to his city. The third weekend, with both men very tired, meant being driven to Brest and back the same day, to speak at a conference in another church. Todd, who doesn’t use a cell phone or wear a watch, spoke to the issues and challenges of technology, particularly smartphones and computers. Ray, playing “good cop” to Todd’s “bad cop,” explained how helpful technology is to him as he tries to explain science to students and various audiences, especially the visual component of technology. Powerpoint is invaluable to him for showing graphs, tables and pictures, as well as showing videos using animation to demonstrate molecular machines inside the cell. Getting personal, he also explained that his wife Sue, a polio survivor who is no longer able to walk (and thus can no longer accompany him to handicap-unfriendly Belarus), needs the technology of her scooter to be mobile at all. Otherwise she would be bedridden, or unable to leave their home—which is what happens to most disabled Belarusians. On Sunday, their last day, both Todd and Ray gave a short 20-minute talk in the small house church of a pastor and his wife who have become good friends of the Bohlins. That night at another small church, Ray answered lots of questions about the Minsk debate. He was especially glad for the question, “Why bother?” Why, indeed, would anyone from Probe go 5500 miles to the former Soviet Union, giving time, energy and passion to the point of utter exhaustion, year after year? It’s an opportunity to provide unbelievers with a reasoned, rational response to evolution. It’s an opportunity to model to Christians how to engage in controversial issues without defensiveness or anger. 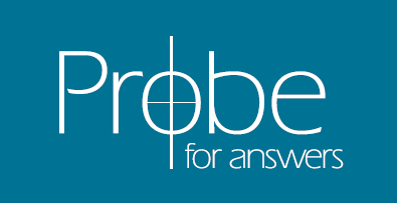 We pray something sticks, planting a “pebble in people’s shoes,” so to speak, sowing seeds of new information and a different perspective by asking questions for which the listeners have no answers. It starts a journey. For over forty years, that’s what Probe Ministries has been doing. Sowing seeds, asking questions, planting pebbles in people’s shoes so they think. In 1973, when Probe was founded, there was no glimmer of hope for debates like these behind the Iron Curtain, much less in the Soviet Union. But look what God did in March 2018! There is a great hunger for honest answers to honest questions in Belarus. The debates are possible because they are about science, not religion . . . because true science—the study of what God created—is the truth that points to Romans 1. And for that, we thank and praise God. Note: The funding for this trip is several thousand dollars short of what was needed to cover expenses. 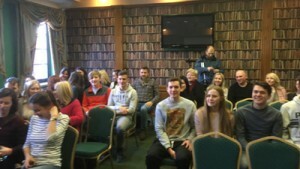 There is still an opportunity to invest eternally in what God is doing through Probe in Belarus! You can donate here and designate Dr. Ray Bohlin. All gifts will receive a tax-deductible receipt.